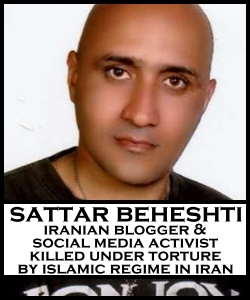 Sattar Beheshti was arrested on 30 October 2012 at his father’s home and as usual was taken to an unknown location. Yesterday, 6 November 2012, the Islamic regime’s police informed the Beheshti family that Sattar has “passed away”! Sattar was a Facebook user and a blogger. HRANA reports that the Islamic security authorities have shamelessly ordered the Beheshti family not to speak out about what has happened, and to refrain from demanding explanations regarding the circumstances of Sattar’s death. Sattar’s family has said that he was healthy prior to his arrest. This is another case of murder, committed by the Mafia thugs and the bandits of Islamic regime. We hold the headmen of the Islamic regime of torture, from Sattar’s arresting officers to Ayatollah Khamenei, responsible for this crime. Mission Free Iran sends condolences to Sattar’s family, friends and loved ones. We will remember him in the dawn of freedom. Down with the Islamic regime of murderers.